Over the past 30 years Wall Street captured the thinking of official Washington, persuading policymakers on both sides of the aisle not to regulate (derivatives), to deregulate (Gramm-Leach-Bliley), to not enforce existing safety and soundness regulations (VaR), and to stand idly by while millions of consumers were misled into life-ruining financial decisions (Alan Greenspan). If you run a big troubled bank, you need a man on the inside--someone who will take your calls late at night and rely on you for on the ground knowledge. Preferably, this person should have little first-hand experience of the markets (it was hard to deceive JP Morgan and Benjamin Strong when they were deciding whom to save in 1907) and only a limited range of other contacts who could dispute your account of what is really needed. We already knew, from the NYT, that most of Geithner’s contacts during 2007 and 2008 were with a limited subset of the financial sector--primarily the big Wall Street players who were close to the New York Fed (including on its board). And the announcement of his appointment was widely regarded as very good news for those specific firms. But today’s AP report, based on looking at Geithner’s phone records, from the inauguration through July, suggest something else. How can anyone build an accurate picture of conditions in the entire crisis-ridden financial sector primarily from talking to a few top bankers? The list of phone calls is not the largest banks, because some of the biggest are hardly represented (e.g., Wells Fargo), it’s not the most troubled banks (e.g., Bank of America had little contact), and it’s not even investment banker-types who were central to the most stressed markets (Morgan Stanley was not in the inner loop). And small and medium-sized banks (and others) always bristle at the suggestion that their interests are in alignment with those of, say, Goldman Sachs. Geithner’s phone calls were primarily to and from people he knew well already--who had cultivated a relationship with him over the years, shared nonprofit board memberships, and participated in the same social activities. These are close professional colleagues and in some cases, presumably, friends. The Obama administration had to rescue large parts of the financial sector, given the situation they inherited. But it absolutely did not have to run the rescue in this exact fashion--bending over backwards to be nice to leading bankers and allowing their banks to become even larger. Saving top executives’ jobs under such circumstances is not best practice, it’s not what the U.S. advises to other countries, it’s not what the U.S. tells the IMF to implement when it helps clean up failed banking systems, and it’s not what the FDIC implements for failed banks under its auspices. The idea that you could leave big U.S. bank bosses in place (or let them get stronger politically) and do meaningful regulatory reform later has always seemed illusory--and this strategy now appears to be in serious trouble. 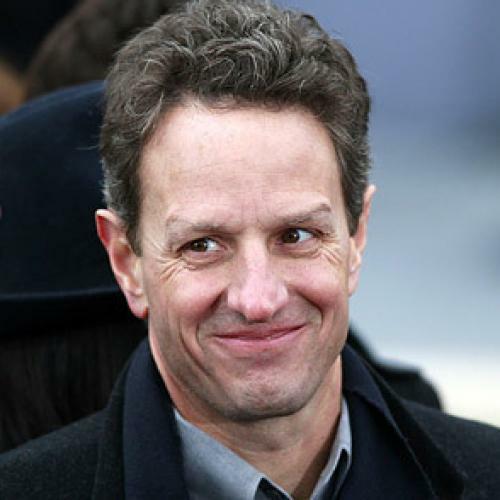 But presumably Mr. Geithner’s financial advisers told him this was the right thing to do.